Comedy band The Grumbleweeds invite young viewers to “Drop in the Coal Hole” for a fast paced party which takes in songs, jokes and impressions. The Coal Hole Club also features a number of special guests that appear to ratchet up the variety of this variety show with Ken Wood, comedy trampoline act The Crazy Tramps, Ray Alan with Lord Charles and Rod Hull and Emu. The second series renames itself Grumbleweeds, but aside from this name change the format retains the same “Grumble-grand, Grumble-get-together” and setting as The Coal Hole Club. Following their success on Opportunity Knocks in the 1960s, The Coal Hole Club was the first television vehicle offered to The Grumbleweeds. A total of 12 25-minute episodes were produced by BBC Manchester over the course of the two series with Tony Harrison acting as producer. Only a handful of shows still exist in the archives due to the BBC’s routine junking policy that was still in place at the time of the both series’ broadcasts. 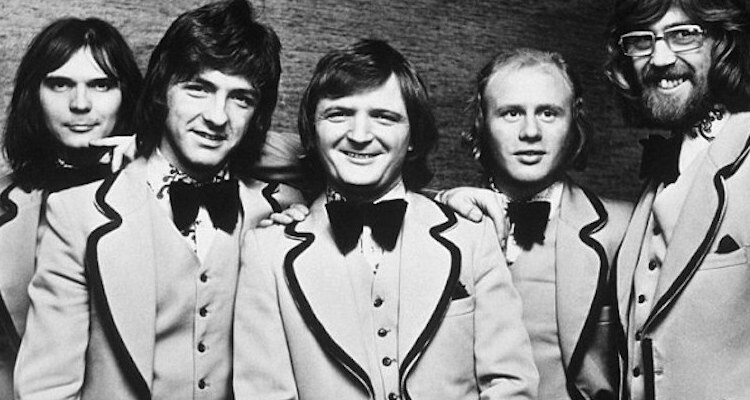 Neither series was ever repeated and, instead, the Grumbleweeds found themselves finding a more permanent home on BBC Radio 2 with The Grumbleweeds Radio Show. In amongst a rabble of riotous, Geordie children who are split into two teams - the Coconuts and Bananas - Gyles Brandreth hosts Puzzle Party, a game show turned quiz turned riddletastic extravaganza with the occasional story or spot of poetry. Sporting a series of jumpers with his first name proudly emblazoned across them, Gyles sets tasks for the two team such as pulling out sheets of newspaper from underneath cans without knocking them over and trying to guess which cream covered jelly has a hanky hidden inside it. There's also time for more standard fare including giant jigsaw puzzle tasks and quickfire quiz questions. Gyles is aided by a series of soft toy and glove puppet gnus with names such as Gnigel, Gnorris and Gnenglebert. 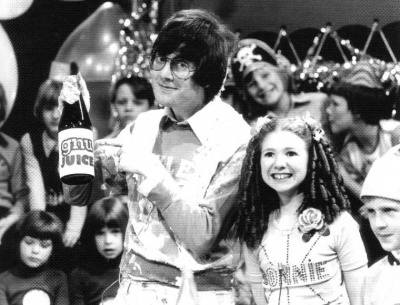 The Christmas special edition of Puzzle Party finds a further helper for Gyles in the form of Bonnie Langford. Puzzle Party contains wall to wall Gyles Brandreth and his ability to engage with the children, even when he's being hilariously obstinate, makes you wonder why he hasn't done more children's TV. It's a riotous, quirky series with a loose and mildly anarchic feel which calls to mind the best aspects of children's TV, but for one reason or another it was sadly short lived. A Tyne Tees Television production, five episodes of Puzzle Party aired in the summer holidays of 1977 in a Thursday 10.40am slot on ITV, a Christmas special followed later in December of the same year. Puzzle Party was produced by Anne Wood (Teletubbies, Pob's Programme, Ragdolly Anna) with repeats airing across the regional ITV stations until 1978. Operated by, depending on the episode, either the Chockagirl (Carol Leader) or the Chockabloke (Fred Harris), Chock-a-Block is a huge, yellow computer packed full of rhyming brilliance and some curious synth sounds. Arriving on the chockatruck, the chockapresenter proceeds to feed blocks into Chock-a-Block which leads to a series of rhyming images being displayed on Chock-a-Block’s monitor e.g. cat, rat and hat. Illustrations and jaunty songs, such as Mary, Mary, Quite Contrary, soon follow to help hammer home the effect of rhyming in language. And then there’s the spinning rockablock which, again, underlines the rhyming theme by matching similar sounding pictures on two blocks e.g. dog and log. Chock-a-Block occasionally grates due to its insistence of repeating exceptionally simple rhymes to the point of head-hammering mundanity, but it more than makes up for this when it comes to its visuals and songs. The Chock-a-Block computer is still a work of yellow brilliance and the songs featured throughout the series are little slices of melodic greatness. And that synth heavy theme is beyond compare. Although it felt as though there were hundreds of episodes, Chock-a-Block only comprised 13 episodes which first aired in 1981 across a single series. Part of the lunchtime See-Saw roster on BBC1, Chock-a-Block was created by Michael Cole and directed by Nick Wilson. Repeats of the series continued up until 1989. 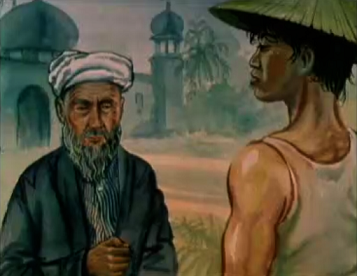 Narrated by Michael Hordern, Eastern Tales is a storytelling series which uses illustrations to retell fables whose origins are embedded deep within the history of Islam. Wisdom is dispensed through tales such as The Obstinate Couple which tells the story of a newly married couple who, upon refusing to agree on who is best suited to the effort of closing their front door, embark upon a vow of silence with the first person to speak having to close the door. Meanwhile, The Envious Wife is a fable which demonstrates how a lowly cobbler is forced into fabricating powers of astrology to help appease his wife’s greed for riches, even if it means the cobbler will lose his head. 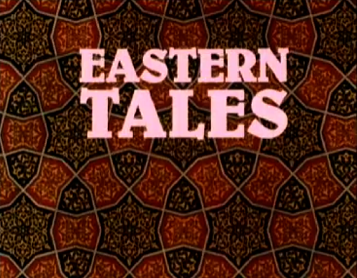 Whilst Eastern Tales doesn’t distinguish itself visually and looks rather static, the gravitas of Michael Hordern’s narration brings a clout of quality to the proceedings. It’s nice, too, for a series of stories to be presented that are set within a different culture, rather than the tired Western traditions. 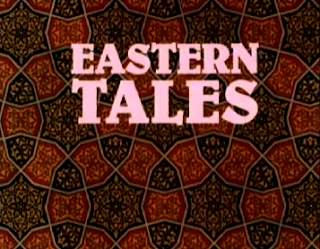 Produced by Yorkshire Television (in association with Yathrib Audio Visual Ltd), Eastern Tales consisted of six 10-minute episodes which aired at weekends in either mid-morning or lunchtime slots. The series was written, produced and directed by Oliver Hunkin who had previously produced religious children’s shows for ITV such as When the Saints Go Marching In and God’s Story. A self-professed “musical paper mouse” who can play drums, the piano, woodwinds, strings and just about anything, Fingermouse has found himself teamed up with the Music Man (Iain Lauchlan) in a landscape of music and puppetry. With demonstrations provided by the Music Man, Fingermouse learns about an array of instruments such as the violin, piano, balalaika and concertina. Fingermouse also ventures into the world outside where all manner of wildlife is waiting down by the river. Drat is a rather scruffy looking rat whose yawns are so infectious that they make boxes of Cornflakes yawn. Old Vole, who lives in a hole, struggles to draw breath due to the ancientness of his lungs. Kingfisher, meanwhile, is a musical sort himself, but his Queen has a tendency to take over the singing duties. Another gem of children’s TV from the stable of Michael Cole, Fingermouse is an enchanting watch which combines a musical education with those stalwarts of children’s TV: stories and puppets. The riverside scenes, in particular, are packed full of charming, paper-based characters that engage on a level that CGI can only dream of. The puppets featured were created by Joanne Cole and viewers were able to write in for instruction packs on how to create their own. 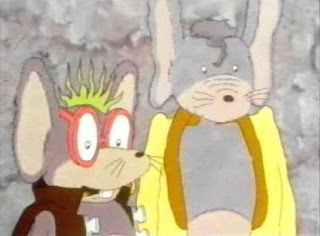 Fingermouse was, of course, a spinoff from its more famous parent show Fingerbobs. And, much like its forebear, Fingermouse ran for just one series of 13 episodes that were broadcast in the lunchtime children’s BBC slot. These 15-minute episodes were repeated for several years with the final airings coming in December 1994. Oxford Circus tube station may, upon a cursory glance, appear to be packed full of businessman rushing to and from work on their commute, but take a second to look beneath your feet and you may just spot the Tube Mice. Squeak (Rupert Farley) was originally a field mouse, but ends up as a tube mouse whilst hunting for his uncle’s inheritance in London. Bubble’s previous home was up high in a tower block, but after being chased into the underground by a cat, she makes the underground her home. Vernon (George Cole) is the definition of an East End wideboy with a selection of fake watches hanging inside his coat and, for reasons unknown, the attire of a Teddy Boy. 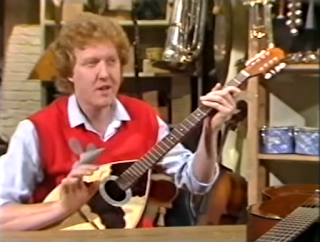 Acting as Vernon’s lackey is the bespectacled, bird-brain punk Toaster (Denis Waterman). Life for the Tube Mice isn’t all nibbling on cheese and gnawing holes in the skirting board. One of their main pursuits is cleaning up after messy old humans who leave all sorts of rubbish lying about at the station. Following the ‘mouse code’ of “We never steal, that’s what we say, we only use what’s thrown away”, the Tube Mice put this rubbish to good use e.g. using an old paintbrush as a rather natty sweep. Aside from these Womble-esque pursuits, the Tube Mice also find themselves caught up in capers that involve rescuing fellow mice from an animal testing lab, taking an American mouse on a tour of London whilst hanging onto an airborne balloon and trying to avoid the sharp claws of a runaway cat. Tube Mice has a highly unusual look that takes in strange perspectives, proportions that are all askew and a twitchy animation style to the characters. Far from being bewildering, though, it’s highly unique and marks it out from its peers. The most wonderful aspect of Tube Mice, however, is George Cole’s performance which is straight out of the Arfur Daley handbook. Engendering the episodes with a healthy dose of Cockney charm, Vernon gets all the best lines and gives the episodes a lively pace. Tube Mice was created by Simon Bor and Sarah Bor who also co-wrote the 26 five-minute episodes alongside Dave Moran. The series was produced by the Bor’s Honeycomb Animation company alongside Television South West. Episodes aired as part of Children’s ITV in a 4.10pm slot. 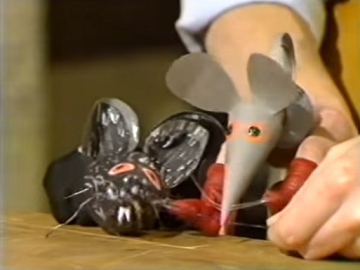 And, with that double mouse ending - apologies if you're petrified of mice - it's time to bring The Forgotten World of British Children's TV to a close once more. Don't worry, though, as there are still many more editions to follow. And, remember: suggestions for future editions are always much appreciated, so let me know if you've got any worthy additions in the comments below. I loved Tube Mice although for a long time, I was the only person I knew who remembered it all. I definitely watched it in the morning during the summer holidays, so it was possibly on a repeat run by then. It also had different opening and closing theme tunes, both of which were great. I don't recall 'The Coal Hole Club' (well obviously, as I wasn't even born for another four years and it was never repeated) but I do remember many years of the Grumbleweeds radio show, as well as them often being bought in as "rent a comedy act" on various TV gigs over the years - I recall them appearing on at least one Christmas 'Bullseye' specials "being funny", for example. I'm unfamiliar with 'Puzzle Party', though the more intellectual puzzles and riddles elements would have most likely have appealed to me. 'Chock-a-block' I remember extremely well from it's regular lunch-time Sea-Saw slot. It always felt like it was a sister production to 'Playschool' as both Fred Harris and Carol Leader were regular presenters on there as well. 'Eastern Tales' probably at the time felt too heavy going for me to bother with, though I have a love for folk tales so would probably actually enjoy it more now. Like 'Chock-a-block', I remember 'Fingermouse' extremely well. It was a follow-on from 'Fingerbobs', where Fingermouse and other assorted finger animals were brought to life. Fingerbobs was probably the better of the two, but I do recall still really liking Fingermouse. So simple and yet so enchanting to my young mind. I never saw 'Tube Mice', I only know of it for featuring both George Cole and Dennis Waterman from 'Minder', one of my TV favourites, and which I seem to recall being promoted with the 'Minder' connection in the TV Times. I don't think I ever really liked the art style enough to warm to it but it likely had some charm if I'd ever given it a chance.